Hey, look! The women are in 2nd place in the ECAC! 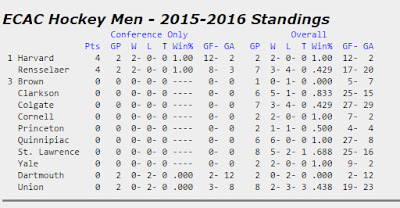 Tied for second, technically, with Harvard and Dartmouth, but they've got a game in hand over both teams, so... yeah! And wow! Just like last year, the men are in 1st place! Tied for first, technically, with Harvard (freakin' Harvard), but hey, better than the alternative! OK, so it's really not that impressive just yet for either team. But the road has to start somewhere, and it's started very well for both squads - unbeaten last weekend. That's the first time that's happened since December 7-8. 2012, when the men won at Yale and tied at Brown while the women swept those teams at home. There's only way to stay on the perch - keep it up. 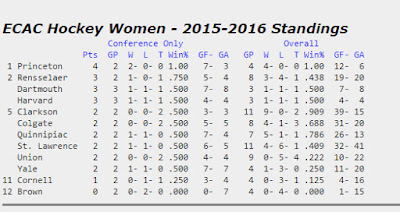 The women have a difficult task in front of them at home against the North Country. The better bet is tonight against St. Lawrence, but the Saints don't seem to be that big of a slouch. Sure, they're 4-6-1, but four of those losses were to Clarkson and Boston College. No shame there. And then tomorrow is Clarkson... and Clarkson's a wrecking ball so far this year (no, that's not the pumpup). The men get to return to the North Country for the fourth time in calendar year 2015 to take on nationally ranked Clarkson tonight and nationally ranked St. Lawrence tomorrow. This weekend marks the ECAC debuts for both teams and is never easy for the Engineers, but they could well be without leading scorer Evan Tironese, who took a hit that was a five-minute boarding call in most leagues but apparently a legal hit in the ECAC against Union last Saturday, and also without Milos Bubela, who is frequently a dangerous scoring threat. In honor of this weekend's games against the North Country, here's a reach back to the past for an ode to alien landings, which wouldn't be the strangest thing to ever happen up there. PROGRAMMING NOTE: In case you missed it on Twitter, WRPI won't be in the North Country this weekend. It was pretty much the perfect storm in terms of announcers being unavailable, and one that hopefully won't happen again, but it's pretty much the risk you run when you have a broadcast that's basically unpaid (we get reimbursed for travel expenses and that's it) and entirely produced by working professionals. However, the good news is that the women's hockey game tonight and hopefully tomorrow afternoon as well will be broadcast. Huzzah!